Volunteers continue work on the new Winona Lake Limitless Park project. WINONA LAKE — A large group of people gathered at the Winona Lake beach on Saturday, April 23, but not just for the sun and the surf. 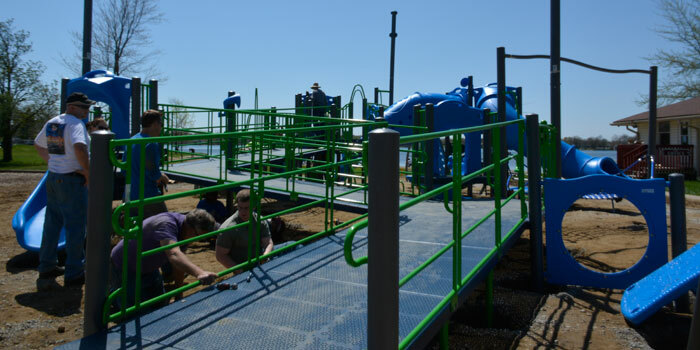 Volunteers and a few city workers toiled under the warm sun, digging holes, setting pipes and connecting slides to the new plastic playground equipment. These people had come together in order to build phase 2.1 of the Winona Lake Limitless Park a reality. “It’s super exciting to finally see our dreams become a reality… It’s amazing to see the community come together,” responded Holly Hummitch, the director of the Winona Lake Parks Department, when asked about the project. The splash pad, which was the feature that helped spark the final concept for Limitless Park. “We started in 2011. It just started as an initial meeting for the splash pad… then we joined efforts with some people who had an idea for a complete playground and the Limitless Park project grew out of that,” Hummitch continued. The playground has been designed with children of all abilities in mind, a very important feature in the minds of those who planned the construction. “This is for everyone, all ages and abilities,” Hummitch stated. Phase 2.1 of the Limitless Park projec. includes new climbing equipment for kids, a concrete divider between the play set and the rest of the park and a new soft play surface on the ground. Phase 2.1 is planned to be completed within two weeks. Fundraising for the park is ongoing. In order to donate, click here.